So, in a previous post, found here, we shared how we were not really prepared financially to do a full blown remodel on the kitchen and the things we did to tide us over until we were. This remodel, the Bitchin’ Kitchen Part II, was that full-blown project we were saving for. This project cost about $3500.00 total. The most expensive thing was the cabinets. 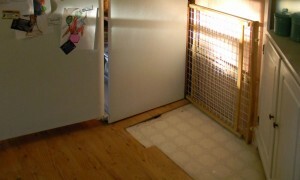 Then the flooring, then the stove. The wall covering materials and trim and incidentals such as the sink, fixtures, range-hood, etc…totaled about the same as the flooring all together. If there’s one thing we cannot stand, it’s mobile home gypsum wall board. UGH!!!!! Oh wait, I can’t stand popcorn ceilings either…but that’s another post altogether. We decided to resurface our walls with a luan-type sheeting. I think this is normally used as a flooring underlayment. I’m not sure why we thought this was a good idea, other than that we have tried sheetrock and spackle before and it was a disaster. But it worked, and now we have walls that we can actually hammer a nail into that hold a picture up. Mission Accomplished!!! Anyhoo, we used 4’x8′ sheets of this very thin plywood-type sheeting and used our favorite project friend Loctite and glued the crap out of it and slapped it up. As always, we used finishing nails on all of the edges and centers to keep it in place. Once that had been up for a few days, we wallpapered the top and put wainscot from Home Depot on the bottom. This House of Fara wainscot kit is the easiest stuff to install, you can give any room an overhaul in about an hour….it’s THAT easy. And no….we don’t make any money from telling you what products we use and linking to them…I wish! I’m just trying to be very specific about what we have used in case you like it and want to find it. Another little tweak we made was to build a bulletin board door that now covers the circuit breaker box. It makes the space useful instead of just having a little cupboard door in the middle of the kitchen wall…which looked pretty silly if you ask me. We also used a different wall board on the cooking side of the kitchen. It looks like tile, but isn’t and it compliments the flooring. I don’t see it on the Lowe’s site any longer, but you can see it in the photos here and look for something similar if you wish. I am assuming you will have a drill if you are attempting a project such as this, but it’s also great to have either one of those handheld tiny circular saws or a jigsaw in order to make your holes for electrical outlets in the wall board, and also vent holes in laminate flooring. We map out and measure these (sometimes wrong!) and then drill holes in the four corners of the square, then place the jigsaw blade into the holes and finish the cut. Be sure to drill your holes toward the INSIDE of the drawn out square so corner openings aren’t too large. Next, we installed the cabinets. 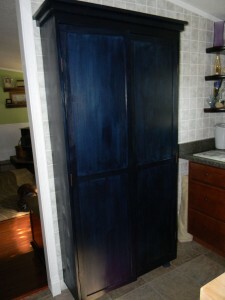 We used Kitchen Classics Merlot Cabinets that are stocked in store by Lowe’s. The hardest part of this was deciding if we would set up cabinets just like we had previously, which I hated because we had a thousand cabinets which were all filled with junk! Or, if we would reconfigure and then use furniture pieces like an island, hutch, china cabinet, to compliment that. We chose the latter and have not regretted it. 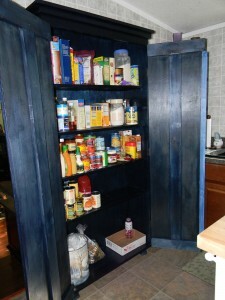 As you can see in the pictures, we opted for one wall of cabinets and built a pantry cabinet (that tall indigo-stained one) to keep food in. 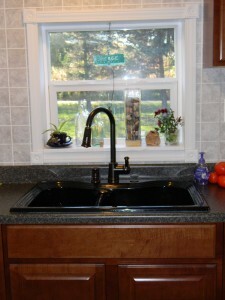 The Belanger Laminate countertops were purchased from stock at Lowe’s and the sink is a Breckenridge Thermocast drop in acrylic sink. We chose bronze finish fixtures (with a hose that pulls out of the faucet….LOVE THIS!!). I really love the whole sink area. It has a very dramatic look! This is also another time when the jig saw came in handy…for cutting out the sink hole. We caulked the hell out of the area around the sink because on the last one, the caulk wasn’t so great when installed and it made the counter behind the sink rot a bit from water getting back there. Not anymore! A word of advice…measure, measure, measure. Know the measurements of the cabinets you wish to buy…in all configurations, so you can map out the best design for your space. I thought I knew what I wanted, then changed my mind after already getting the cabinets. I had to return a bunch and re-imagine what I wanted. It was a pain! Once these were in, we waited a few weeks before picking out a stove. But soon we settled on a black, gas stove that I love. I cook a lot and it’s wonderful to have a nice stove with a great self-cleaning oven and a timer and a light and all that fancy jazz. It doesn’t take much to make me happy :-) We still, almost two years later, not gotten a black refrigerator. I know, I know, what the heck is wrong with us? It’s not for lack of money…it’s just pure laziness! Or maybe the fact that we have already started three or four other projects before we finished the kitchen and it just got lost. I’m sure you don’t know anything about this since you’re probably much more organized in your projects than we are! Anyway, we complimented our storage needs with a hutch, a corner cabinet, and the pantry we built. Instructions for this pantry can be found on Ana-White.com If you have never used that site, you should. We never dreamed that we would become furniture builders, but this site has turned us into furniture building monsters. We’ve since built a queen-sized storage bed with a huge, rustic headboard, a desk and picnic table for our grandson, an end table for our living room, a trellis planter for my mother-in-law, and the list goes on… There’s quite an amazing community of newbie builders over there and we are all lovin’ it! Our Bitchin’ Kitchen took us about 2 weeks to complete ourselves. It sucked not having running water in there, but our small bathroom doubled as a dish washing station and we bought a lot of microwaveable stuff and subs for that time. We hope you enjoy looking through this post and dreaming about the ways you will update your kitchen. The kitchen has always been the heart of any home I’ve ever lived in and it deserves a good treatment. If you have questions…please, feel free to ask away in the comment section below the post so others can join in the conversation. Thanks to all of you for hanging in there and not complaining that I haven’t gotten this post up sooner. As you can see, I wanted it to be thorough and detailed so getting it together was a bit of a job. A couple of additional notes…the wallpaper is a merlot color textured paper. The island is a Martha Stewart brand piece that my mother bought at K-mart several years ago, but this type of thing can be found at such places like Homedecorators.com and even Big Lots…which is where we bought the fabulous dinette set that is a small square table with a granite lazy Susan in the center and the sides come up to make a round table that serves 8. How about that!!! The ceiling fan was bought at Lowe’s as well. So, you see, nothin’ in this joint is fancy. We found the hutch and corner cupboard on craigslist for about $100 each and they fit our needs perfectly. Good luck on your very own Bitchin’ Kitchens! UPDATE: Already with the update? Well, I was reading the post over to Big D last night and he wanted to be sure I included some advice from our experience about letting yourself cry out your frustration. We had to raise all of our electrical outlets because we used a counter with a back splash. Whenever we change something like that, we replace it with new. So, ONE of those outlets had a weird configuration of actually controlling the ceiling fan/light fixture all the way across the room. Don’t ask why, it’s a mobile home, that’s the only reason I have for you…you know what I’m talking about. After a whole day of scratching our heads and looking at the photos we took of it just in case, and connecting and reconnecting, we both sat in tears looking at the whole day’s work we had thought we would have done at that point that was not to be had. Finally, we asked my dad, nickname Thunder, to come and help us because he’s amazing and can do anything…and we all figured it out together the next day. Something like this also happened with our hood exhaust. We converted to a non-venting exhaust with a special filter. Because of a weird spot in the wall, it would not press flat and look level for all the hope in the world. These things will really break you down if you are trying to be organized and work on a schedule. Be prepared to walk away from something and move on or just stop for the day. Don’t take it out on each other, and remember that you all want this thing done as well and as soon as you can. You’re all on the same team! 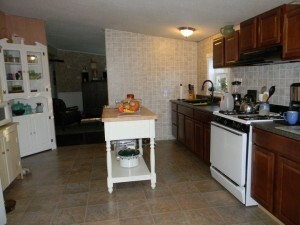 We are ready to remodel the kitchen in our 12X60 1996 Oxford Mobile Home. We would like to use the stick built home – standard size and weight cabinets. We have been told that on the hanging wall cabinets, we are limited to the smaller, thinner, and lighter mobile home style cabinet styles, because the walls cannot hold the weight of a stick built residential cabinet. I image we could use either style of base cabinets? What is your advice? Hi Charles! Thanks so much for visiting and sharing your story. I am not an expert on mobile homes, but I am an expert on the single wides (2- 1968 trailers) and 2 double wides I've owned (one a 1995 Fairmont and the other a 2003 Fleetwood). If your home was built in 1996, I'm pretty sure your exterior walls are 2×6 framing. 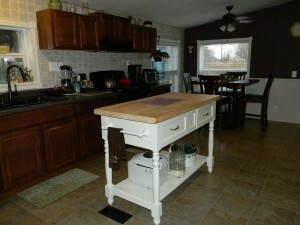 If your kitchen cabinets sit on the exterior walls, personally, I would use a nice stock cabinet. A 2×6 stud framing should be able to support stock cabinets just fine. That's what stick built homes have. Again, I am not a contractor or an expert on mobile home construction, but if you can confirm your exterior walls are 2×6, I would install stock cabinets on them myself. Our walls are 2×6 in our 1995 home and we have installed stock cabinets. The only thing you may find is that your area may be small and fitting regular cabinet widths might be tricky, but can be done with good planning. Also, you may find your outlets are not high enough if there are some on the wall under the upper cabinets. You may need to lift these a few inches. We had to do that because the counter we chose had a built in back splash that sat too high. Personally, I think people give random advice based on myths they have heard about manufactured homes. We have remodeled one of our homes (the one on the blog) completely and have never ever ever ordered a single thing for the interior of the home that was standard mobile home material. We have always used stock materials at Home Depot or Lowe's. For the exterior, we have ordered the jumbo crossover heater vent tubes and underbelly plastic, but that's it. We own a double wide would like to remove part of a wall to get open concept . Do not know if it's a bearing wall?? In our search for a new home, I've seen a lot of older double wides that have been remodeled to an open concept. They look stunning! Good luck with your project. Please feel free to share pics on our facebook page. We'd love to see your progress! Has anyone had any issues with putting grout and tiling your Mobile home walls? Kitchen or bath? I'm concerned that house movement may cause cracks and want to also be sure that it will stick to the walls. Or should you prepare the walls somehow? Welcome, Tammye, and thank you for commenting. I haven't used tile in our mobile home before. However, I would probably have the same concerns as you are asking about since we've experienced some shifting over the last year that has effected some things in our home. I imagine the shifting would also affect tile/grout if we had some. We haven't ever used actual tile before. We have used 4×8 wall board that looks like tile as our kitchen backsplash though. So, we aren't having any problems with that due to the shifting of our home. Knowing what we have experienced in the last year, I am not sure I would use tile/grout in our home for the very reason you suggest. Have you found any further information about this? Have you tried it yet? I love your remodel. I dont have money saved up but I want to remodel my kitchen to be more to my taste. 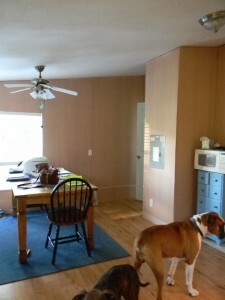 I am thinking of painting the cabinets myself. The wallpaper is dated and the countertops actually go up the walls for backsplash. Thanks for visiting and commenting, Lisa. We loved remodeling our kitchen. It was a lot of work, but you can make changes that have a big impact without a lot of work. Painting the cabinets is one way to do it. Putting in a laminate floor (these are pretty cheap and easy) is another way.A dramatic new sink is a nice switch up too. Our sink cost less than $100 and I absolutely love it. Makes a huge impact on the way our kitchen looks. You can paint over wallpaper too. My grandmother did that in her 1968 mobile home nearly 25 years ago and it looked terrific. Good luck with the changes you hope to make ! 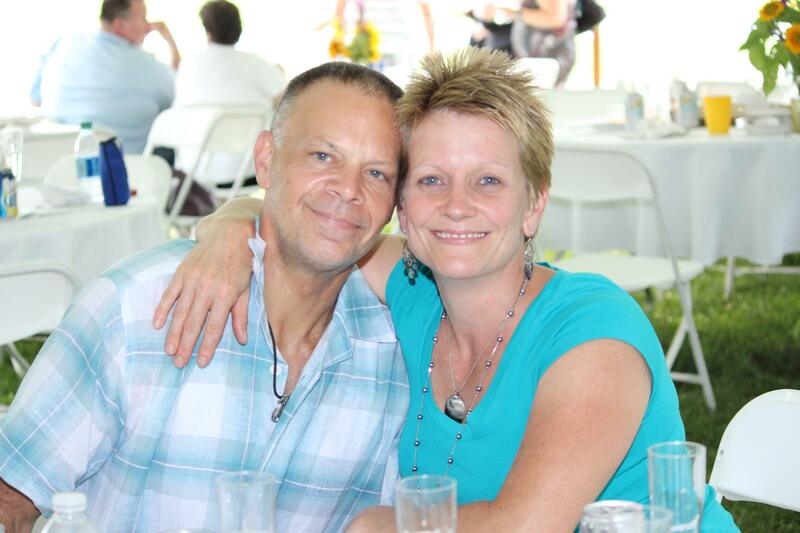 My wife and I are in the process of finalizing plans to retire, which includes selling our traditional home in a nice neighbourhood, looking for a suitable location and picking out a used manufactured home (mini home or mobile). Your site has given me renewed optimism about making these changes in our life. After seeing what you have done making over your home, I'm now confident that we can do the renovations together (for the most part). We are both 65 and I'm in good health, albeit not perfect, having had heart surgery about 9 years ago. Our family is now grown and we still are carrying a mortgage, which we plan to pay off by selling our home and using the surplus to purchase a mobile home and the land. We are fortunate that we live in an area of Canada that has a relatively low cost of living, and so are able to do this. I guess you could say we are looking to right-size our lives, and live debt free for the first time in the 45+ years we've been married. We lived in a mobile home for a couple of years before building the home we are in and I can honestly say that I very much enjoyed it. Looking forward to incorporating some of your ideas in our new location , hopefully by late next year (2015). Thank you for this very informative blog! Great ideas. 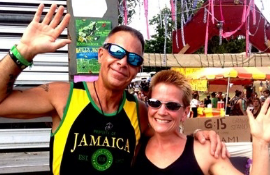 Greg- Thank you so much for visiting and posting a comment. Your note really made my day! I love it when the ideas we offer here inspire others to feel good about taking on something new or making changes they thought might be difficult. We are also beginning to eye retirement (the Mr. is 9 years older than I so I've had to start thinking about it much sooner than I thought!). We've thought about moving to warmer climes and living in a single wide in an over 55 mobile home park. This idea really appeals to both of us. Living in a mobile home allows for simplicity and that's just what retirement calls for in my view. A "right-sized life" is a perfect way to describe it. Good luck to both of you as you move through this transition in your lives. May the coming days bring you lots of comfort, ease, and enjoyment. The kitchen was the first thing I remodeled when we bought in 05, it has since been changed again, just to keep it looking fresh. We replaced the back splash tiles with the newer looking smaller glass tiles. Everything else stayed the same. We love our remodeled kitchen with granite counters. Thanks for commenting Marjie, and welcome to MyMobileHomeMakeover.com! I understand when you say that you changed the kitchen again after remodeling it once. We sometimes get a hankerin' for some new look or feel inspired to make a change and go at it again. But I think this year we are hoping to settle in and enjoy it for a little while. It is hard to stop once you get started though, isn't it? I would love to have granite counters, but I couldn't bear to spend the money on them. Maybe someday… I'd love to see pics of your place! If you think of it, head over to our facebook page at https://www.facebook.com/mobilehomemakeover and share some with us! We just bought a double wide as a winter home in Arizona. Kitchen needs to be gutted. This gives me some hope. Thanks for visiting and for leaving a comment, Kathe! A Winter home in Arizona sounds like a dream to this Upstate New Yorker :-) What made our kitchen remodel go the most smoothly was pre-planning. We thought everything through very carefully, picked all of our colors and textures and materials and appliances ahead of time, priced them out, used coupons and discount pricing as often as we could, and then planned a strategy for order of work that would leave us without use of the kitchen for the least amount of time. This is not to say that things don't go wrong, that we didn't have problems that arose, or that we didn't find ourselves crying together when the exhaust vent wouldn't attach levelly due to a large hump in the wall :-)….but I'd hate to see how our project would have gone without all of this planning. Good luck to you on your project. If you have any questions, or need inspiration, please feel free to come back and send us a message…or come back when you're done and share your story! Hi Cilla. Thanks so much for your comment. I'm glad you've found some inspiration here. I would love to see pics of your finished work when you get ready to share. Please stop by and share a link when you can! Thank you for saying not taking frustration out on each other, because at the end we are both on the same team. Thanks for your comment, Ivy! We work together as a great team…but we do have our moments. It takes a lot of practice to remember we both share the same goal and arguing only keeps us from meeting it. Good luck on your projects! Hi Lisa. I'm sorry to hear of the damage and the lower claim payout. This is one real problem with mobile homes. 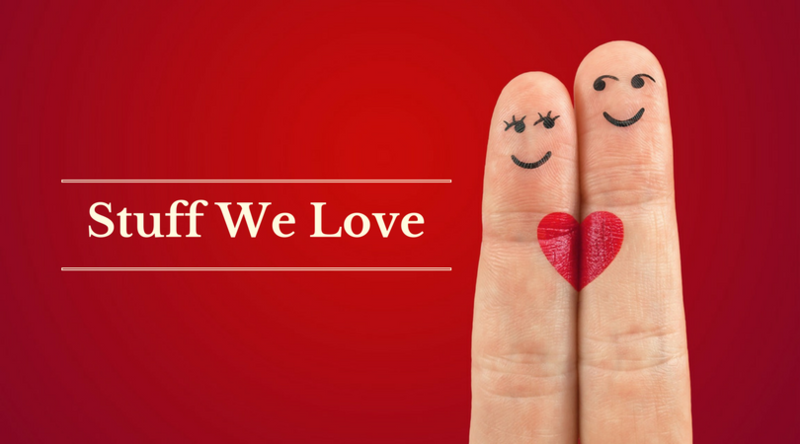 On our policy, no matter how much work we do on our place, we can still only insure for the price we paid for it. It doesn't seem fair to me, but insurance never is fair so I guess we'll just have to get over it. I really like it and vents just fine. I cook a lot so it gets plenty of use. We did run into some trouble in that there was a slight hump in the wall in the place we needed to hang it. It was not lining up properly with the underside of the cabinets we put up above it and a tiny gap between the two on one side was really getting under my craw. Finally, it adjusted and we screwed it in (after some crying and swearing!). Good luck with completing your remodel!